 The new Geo poly four legged chair forms part of the new Geo range. With a modern fresh design, the Geo four leg is ideal for classroom use.  Eight of these chairs can be stacked together to help save space.  Available in four sizes along with ten seat shell colours (yellow, lime, ocean, sky, flame, mulberry, white, red, slate or onyx) and six frame colour options (light grey, chrome silver, textured silver, dark grey, black or charcoal).  Can be optionally supplied with a storage trolley to help stack and move multiple chairs.  This chair has passed EN1729 parts 1 and 2 for strength and ergonomics.  The new Geo Skid Base Chair forms part of the new Geo range.  The skid base frame allows for easy movement across floors.  The new Geo Reverse Cantilever Chair forms part of the new Geo range.  The Reverse Cantilever frame allows for the chair to hang on the classroom desk to allow easy floor cleaning.  Available in two sizes along with ten seat shell colours (yellow, lime, ocean, sky, flame, mulberry, white, red, slate or onyx) and six frame colour options (light grey, chrome silver, textured silver, dark grey, black or charcoal). 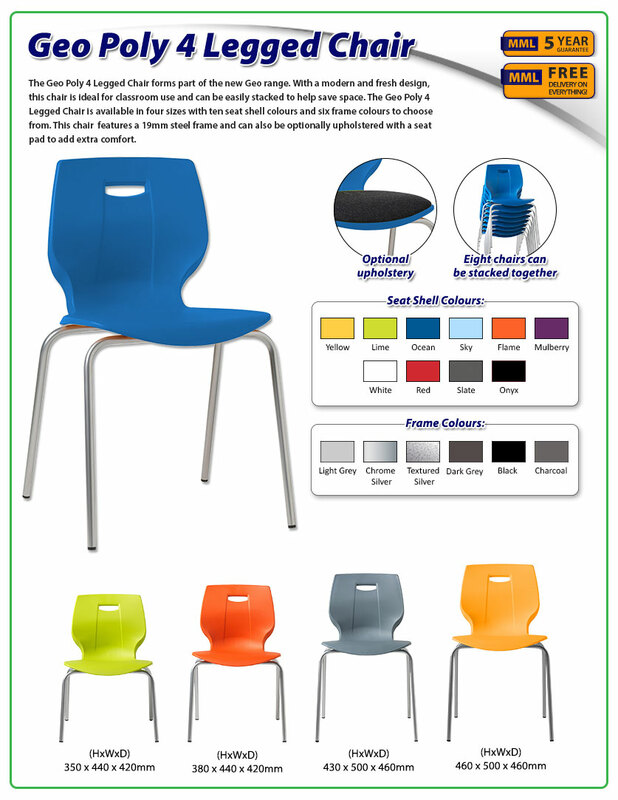  The new Geo Student ICT Chair forms part of the new Geo range.  Designed to give excellent ergonomic posture, this chair features an easy to use gas lift height adjustment lever. 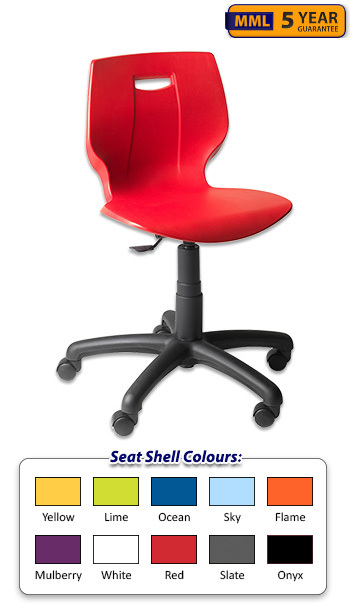  Available in ten seat shell colours (yellow, lime, ocean, sky, flame, mulberry, white, red, slate or onyx).  Dimensions: (HxWxD) 390-520 x 600 x 600mm. 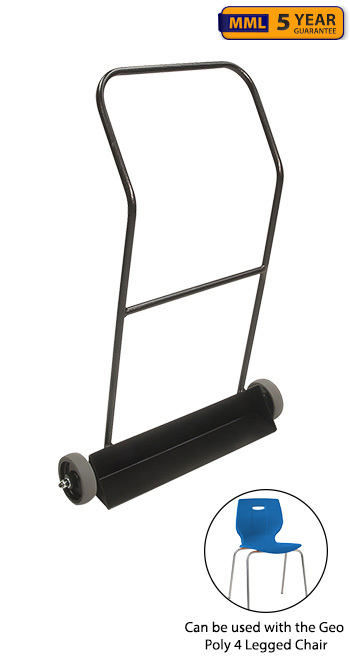  This Chair Removal Trolley is suitable for use with the Geo Poly 4 Legged Chair.  Ideal for helping to stack and easily remove multiple chairs.